Deliveroo has taken Brighton by storm and I for one have jumped on the band wagon. 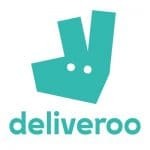 These days, it’s impossible to venture onto the streets of Brighton without spotting a Deliveroo cyclist on a mission to deliver food from our favourite restaurants right to our doors. Now nothing can stand in the way of a decent meal. 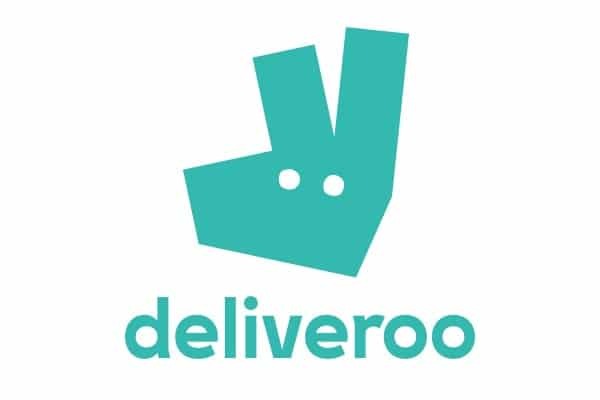 With Deliveroo, getting your chops around whatever your stomach desires in the comfort of your own home has never been easier. And the website couldn’t be simpler to use. Just type in your postcode to see what’s available in your area and how long it will take to get from the restaurant to your plate. You can check up on your all aspects of your delivery online. While you wait, you can find out when your food’s been made and where it is via the map function on the site. You can also see from the timer how many minutes more it will be before dinner is served. Tonight our dinner is a burger take-away from Coggings & Co and our food comes sooner than expected, which is nothing to complain about. We are told our order will be with us in 65 minutes from the point of paying, but it arrives after about 40 minutes. Everything is handed over in a big, brown, branded paper bag by the jolly delivery cyclist who comes to the door. 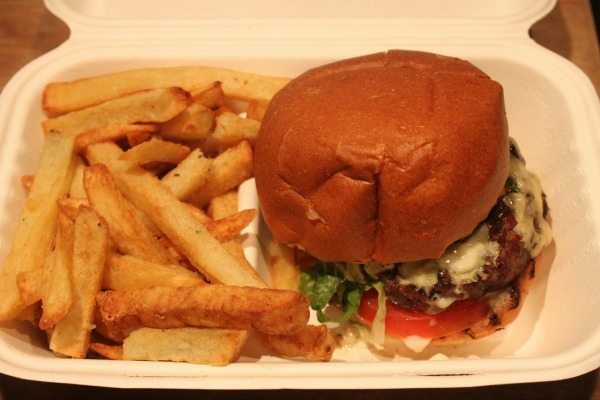 All the food comes packaged separately in white boxes; the extra dips come in little plastic pots; and the name of each burger is written on the top of its box to avoid any confusion. 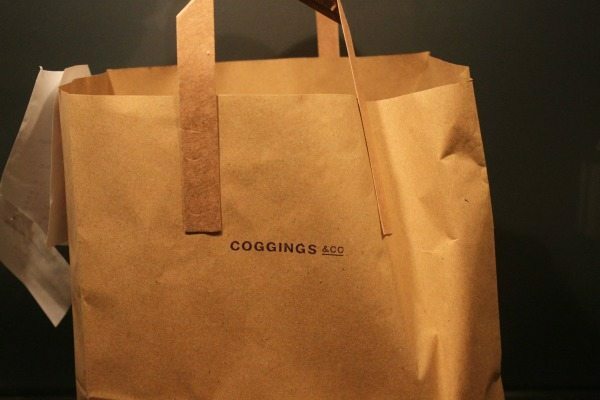 The selection available on the Coggings & Co take-away menu via Deliveroo is vast. Along with around seven burgers (cooked in either organic vegetable oil or beef dripping) to choose from, there is a wonderful array of snacks and sides. These include: Antipasti Olives, Wasabi Cashews, Jalapeno Stuffed Olives, Roasted Squash, Pesto & Green Leaf Salad, Beer-Battered Onion Rings, Sweet Potato Fries and Red Cabbage Coleslaw. Choosing just two of these to have alongside our burgers is tough, but as the burgers already come with chips, choosing more would be outrageous. There is a great selection of craft beer available as well, and nothing goes with a burger better. These include: Ballards Wassail, Brighton Bier Pale Ale, Chapel Down Curious Brew, Dark Star Sunburst, Hepworth Organic Blonde Gluten Free Lager and Firebird Fireweisse Weissbier, to name a few. We are pleasantly surprised by the amount of food that we receive. We are also impressed that everything has retained its temperature. The burgers and the onion rings seems to have held up particularly well in transit. 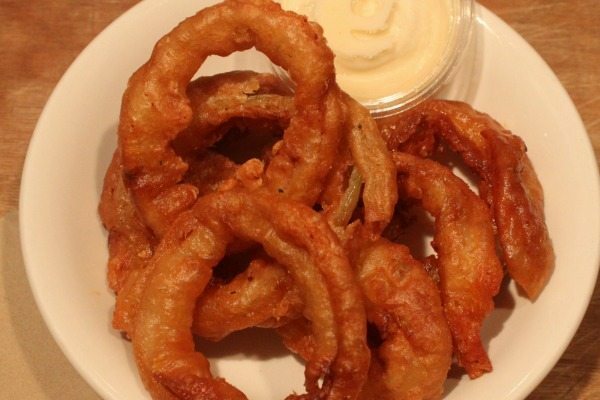 The onion rings have a great deal of crunch, no soggy batter in sight. The burgers have held together really well and look glistening and plump inside their boxes. The sauces inside have stayed put and only a few stray pieces of lettuce have managed to break free of the bun. The accompanying chips share the same box as the burgers, but have stayed relatively separate during the journey and so also kept their consistency. All in all this makes the dishing up process a breeze. My burger – ‘6oz Beef, Barber’s Cheddar with Beef Dripping’, served with tomato, mayonnaise, dill pickles and salad (£10.95) – is a classic burger, bursting with meat, salad and sauce. 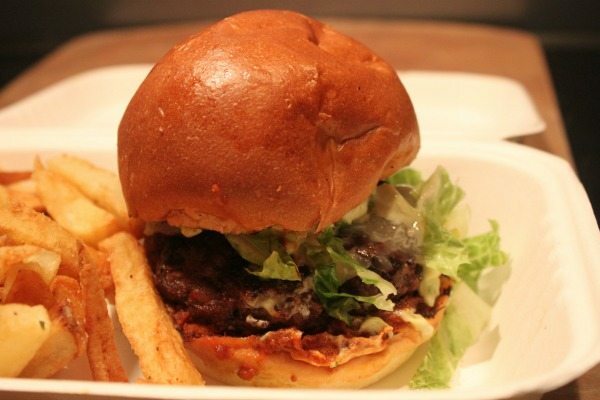 The patty is juicy, tender and melt in the mouth good. The cheese really makes its mark and the pairing of the pickles with the creamy mayonnaise, and the crunchy salad, complement everything perfectly. The brioche bun is golden, soft and slightly sweet. I personally believe there is no other bun to serve a burger in. I never normally go for the classic burger; I am always in search of something a bit more unusual. But I have to say, there’s no denying this ‘classic’ combination works very well. My partner’s burger is the ‘6oz Beef, Manchego Cheese with Beef Dripping’, served with chorizo jam, roasted garlic mayonnaise and salad (£11.75). We have both chosen the beef dripping rather than the organic vegetable oil option (without any deliberation). We agree that when it comes to burgers there is no point in holding back. We intend to be as indulgent as possible. I can’t tell you for certain if the burger tastes better cooked in beef dripping, as I have no frame of reference, but I feel confident it was the right choice. As well as the wonderfully flavourful meat – which is locally sourced and freshly ground daily – this burger comes adorned with melted Manchego cheese and smothered in sweet and spicy chorizo jam and gloriously garlicky mayonnaise. What a combination! The ‘Beer-Battered Onion Rings’ (£2.95) and ‘Red Cabbage Coleslaw’ (£2.50) go well as sides. And along with the portions of triple-cooked chips this is one formidable dining experience. In all honesty, we don’t really need the extra sides, but they are such a delight it is impossible to regret ordering them. The onion rings are unbelievably moreish with a beer batter coating that is delicious and crunches with each bite. We are also sent two complimentary mayonnaise dips which we waste no time dunking the onion rings in. 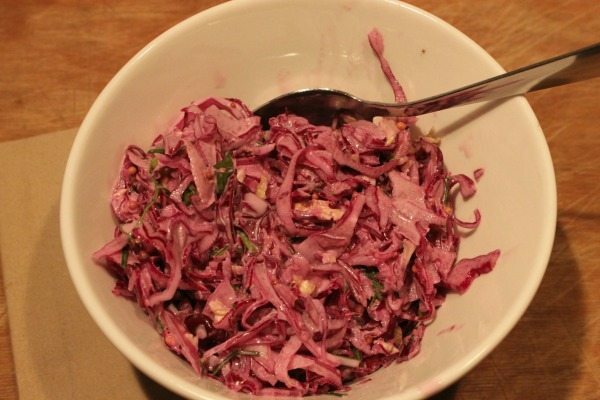 The coleslaw is crisp, colourful and fresh. This side adds some variety and a welcome change from the meat and carbs. To wash it all down, we have chosen two beers from Coggings & Co’s impressive selection. A Brighton Bier Pale Ale (£4.50), which is a firm favourite of mine, and something we have not tried before for my partner: Firebird Fireweisse Weissbier (£4.50). Both beers are delicious. 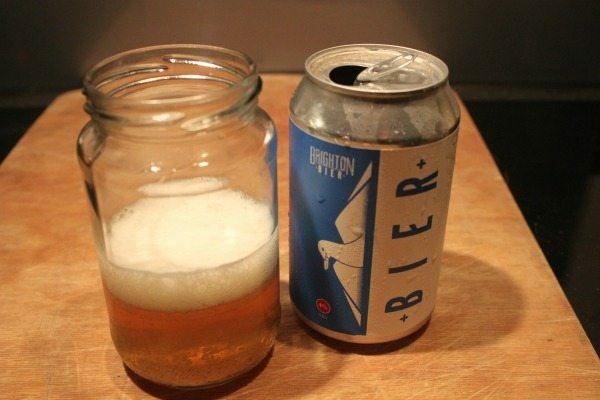 The Brighton beer is hoppy and distinct. The Firebird Fireweisse is more fruity and light but equally as interesting in taste.